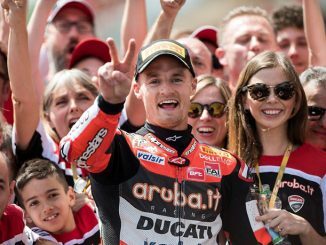 Chaz Davies (Aruba.it Racing – Ducati) wrapped up a superb weekend on Sunday at the Lausitzring in Germany, with his second victory of the Prosecco DOC German Round in race 2, whilst Jonathan Rea (Kawasaki Racing Team) and Marco Melandri (Aruba.it Racing – Ducati) also secured podium results. With light rain falling during the final laps the WorldSBK riders had to focus hard in order to avoid any mistakes and Davies did just that to register a third victory in four races at Lausitzring. Coming from the back of the third row on the grid, the Welshman ultimately beat Rea across the line by 2.29s, with Melandri just over two further seconds back having held the lead early in the race. The results saw world champion and standings leader, Rea, open up a 70-point gap over his teammate Sykes in the standings with four rounds to go. The WorldSBK grid returns to action September 15-17, at the Autodromo Internacional do Algarve, Portimão, Portugal. Jordi Torres (Althea BMW Racing Team), German wildcard Markus Reiterberger (Van Zon Remeha BMW) and Xavi Fores (BARNI Racing Team) completed the top ten. A brave ride by Stefan Bradl (Red Bull Honda World Superbike Team) saw him finish 13th, after he missed Race 1 due to severe elbow pain from a crash on Friday. As the riders enjoyed their first race since the summer break it was Welshman Chaz Davies (Aruba.it Racing – Ducati) who produced a superb ride at the Prosecco DOC German Round on Saturday, taking victory by a 1.834s margin from Jonathan Rea (Kawasaki Racing Team), with Tom Sykes (Kawasaki Racing Team) also on the podium. Repeating his Race 1 victory from Lausitzring last year Davies controlled the race well after starting in sixth on the grid, taking the lead on the second lap. He was too strong for Rea and Sykes despite their best efforts to chase him down. 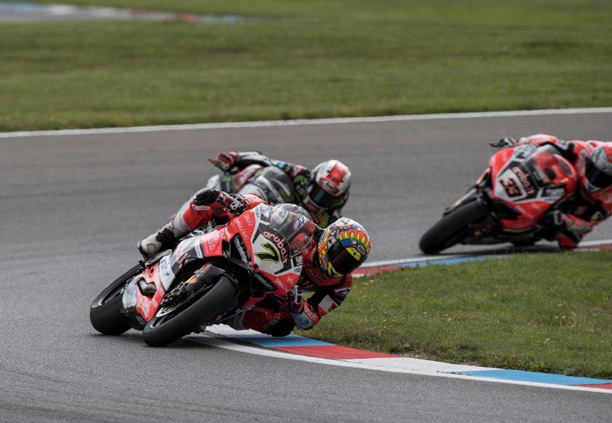 The Saturday contest at Round 9 in Germany saw Marco Melandri (Aruba.it Racing – Ducati) cross the line in fourth place, 16 seconds down on his teammate Davies, with Leon Camier (MV Agusta Reparto Corse) getting a creditable fifth place as he finished half a second behind Melandri. Alex Lowes (Pata Yamaha Official WorldSBK Team) put pressure on Camier for fifth but just missed out by 0.186s as the highest finisher on the YZF R1.